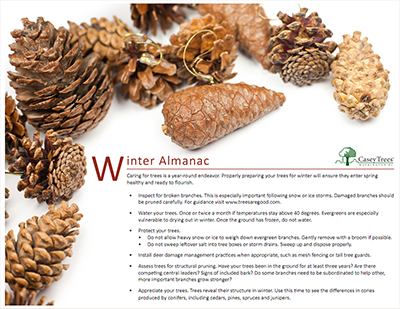 Casey Trees is marking the first day of winter with the release of our Winter Almanac, an informative guide for tree care and maintenance during the cold months. Inspect for broken branches. This is especially important following snow or ice storms. Damaged branches should be pruned carefully. For guidance visit www.treesaregood.com. Water your trees. Once or twice a month if temperatures stay above 40 degrees. Evergreens are especially vulnerable to drying out in winter. Once the ground has frozen, do not water. Protect your trees. Do not allow heavy snow or ice to weigh down evergreen branches. Do not sweep leftover salt into tree boxes or storm drains. Sweep up and dispose properly. Install deer damage management practices when appropriate, such as mesh fencing or tall tree guards. Assess trees for structural pruning. Have your trees been in the ground for at least three years? Are there competing central leaders? Signs of included bark? Do some branches need to be subordinated to help other, more important branches grow stronger? Appreciate your trees. Trees reveal their structure in winter. Use this time to see the differences in cones produced by conifers, including cedars, pines, spruces and junipers. You can download the Winter Almanac from the Fact Sheets page on the Casey Trees website. I really love the Winter Almanac. What a great publication! Thank you for putting this together and sharing this with us!